Fair Squared are one of my favourite organic, natural skincare and beauty brands, and their products are all vegan and Fair Trade. They never test their products on animals – so they are right up my street. Fair Squared are one of those companies that have so many certifications that they can barely fit them all on the packaging; Vegan Society, Fair Trade, Peta, Natrue, and Fair Rubber. They sent me this lovely Christmas gift set to try out. 4 cute mini skincare essentials, all certified vegan and Fair Trade, using natural ingredients. At £8.95 this is a really good idea as a Christmas gift set for a friend or family member who likes organic, natural, vegan, cruelty-free products, and a good introduction for someone looking to get to know an organic brand like this but doesn’t know where to start. I really love the simple packaging on these bottles. Green Tea Body Lotion: containing the finest Fair Trade green tea from India. I love body lotions as I do get very dry skin, especially in winter. This bitesize bottle is perfect for handbags or leaving by the kitchen sink. Vanilla Shower Gel: contains Fair Trade olive oil from Palestine. A cute sample of a classic in their range and convenient for taking to the gym for the post-workout shower. Apricot Shampoo: contains Fair Trade apricot kernel oil from Pakistan. A lovely lather and a beautiful smell of apricots, which is not an ingredient I would immediately think to put on my hair, but the smell is so good that I would definitely use this again. Olive Hand Soap: contains Fair Trade olive oil from Palestine. A really nice and supple soap, left my hands very soft. You can buy more of Fair Squared’s range here. * Denotes a gift I received. My opinions are nevertheless my own and I always give honest reviews. I’ve been delving deeper into vegan & organic natural skincare recently and on my hunt for ethical, organic products I have come across a really great brand called ORGANii; their range includes shower gels, body wash, soaps, and sun cream, and they are all about natural, organic ingredients – and everything is suitable for vegans! Today I have two products to review, which ORGANii have kindly sent to me to try out. They are both suitable for vegans and certified by organisations that guarantee organic ingredients; you can find out more about the Ecocert and Ecogarantie certifications here and here. I really like the cute packaging on this product – it looks like a little bottle of milk! It claims to be “delicately fragranced” with shea butter so the scent is mild and slightly nutty. This shower gel is so wonderfully gentle on the skin – perfect for sensitive skin and children – and lathers up nicely. Shea butter is known to be a great nourisher for the skin as it contains natural vitamins and fatty acids and this product really leaves my skin soft and re-hydrated – very impressive for a product designed for everyday use with no claims to spa-standards. It’s particularly impressive that they’ve made such a great everyday shower gel without all the usual stuff & nonsense that non-organic or non-natural brands feel it necessary to put in. I’ve used it a few times so far and it feels like this 300ml bottle will last a lot longer than I’m used to, which makes it good value for money. Other scents include: aloe vera and bamboo, strawberry, argan, and liquorice, which I am really intrigued to try! Lavender is one of my favourite scents; in soap, in creams, in cakes, in my garden. So I was already pretty certain this soap would be a winner and I wasn’t wrong. I love the packaging again – it’s got cute little colourful hands and there is a little sprig of lavender on it as well. Again, this product is completely vegan, natural and organic, so it ticks plenty of boxes for the ethical consumer. It’s also full of organic olive oil so it creates a really nice moisturized effect, which I was very impressed with as I always feel like with other soaps I need to moisturize after washing my hands as many soap brands dry out my skin. My hands have always been quite dry and are the skin is prone to cracking in winter so this soap has come to me at the right time. The liquid soap also comes in rose, citrus, and a neutral aroma-free – I can’t wait to try the rest! ORGANii is a small independent British brand with products available in health stores and online at: www.organii.uk. You can read more about their ethos here and you can track down your nearest stockist here. I cannot recommend this range enough – all cruelty-free, natural, organic, and vegan, with beautiful mild and gentle aromas. Both products come in at around a fiver so they are pretty affordable for a vegan organic brand. The natural/organic certifications are very reassuring because it means that I can be certain when using these products that they are sourced from organic, natural ingredients from sustainable sources; they are therefore cruelty free, better for the environment, and better for your skin. Hello! 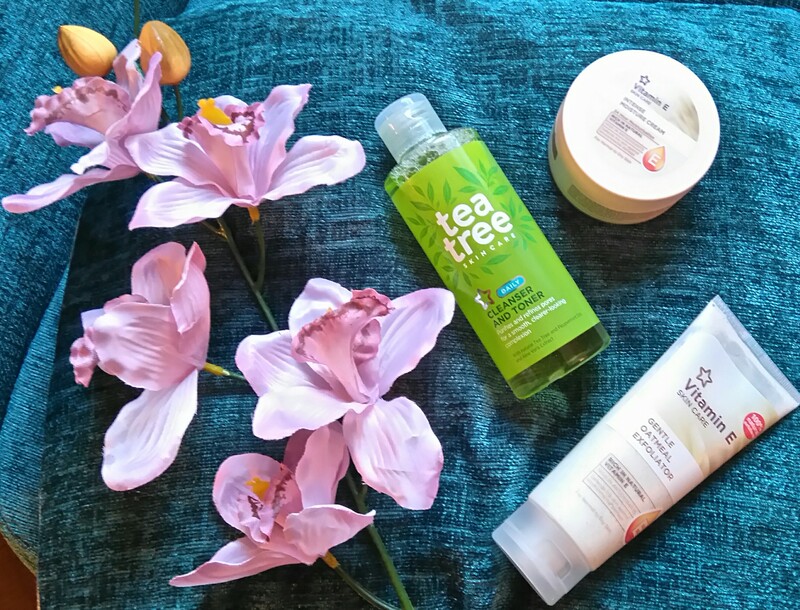 It’s another monthly favourites post and this one of about some cruelty-free skincare products I’ve discovered recently. For years I eschewed the idea of expanding my limited beauty and skincare collection for several reasons: fear it was tested on animals; a general mistrust of trying to look one’s best; and a basic laziness and absence of interest in make up. But since the Leaping Bunny stuff really took off I find I’m happy to put some time and effort into finding reliable cruelty free products. And today I’ll share a few that I’m loving. Superdrug Oatmeal Vitamin E Exfoliating Facial Scrub: vitamin E, I’m told, is a vital antioxidant that can help to protect my skin from sun damage. This one uses oatmeal to help exfoliate and it does feel good, like I’m working my skin. It smells nice but the only downside it does take a while to rinse it all off. Superdrug Tea tree cleanser and toner: this has a nice feel and is minty and refreshing. It certainly brightens up my skin and leaves it feeling smooth and with clean pores. Superdrug Vitamin E Moisturizing SPF 15 day cream: I’m a big fan of Superdrugs Vitamin E range (can you tell?) and having read a bit about it I now find it has horse chestnut extract, which sounds very unusual and interesting. This is a great facial moisturizer and I can still feel that my skin is soft by the end of the day so it definitely does the job. It has added SPF 15 sun protection as well.